It was a long time ago now that I was a little girl sick in a hospital bed. I came down with nephrosis when I was about a year old. Totally unexpected - no forewarning. My mom knew something was wrong. She was instructed to see Dr. Reilly at Columbia Presbyterian Hospital in NYC. He was the expert, our local small-town doctor didn’t know that much about the illness, as he had only seen one other case in all his years of practice. I remained in that hospital for several years, being allowed to go home only on special holidays. My mom being a devout Catholic, would come to the hospital with her rosary beads and pray; she didn’t know what else to do. The priest was called in on three different occasions to perform the last rites ceremony the church called Extreme Unction. I always told my mom that I would be okay, that she didn’t have to worry. However the doctors told my parents not to get their hopes up-they didn’t think I would make it to adolescents. I think that is a terrible thing to say to a parent; I would never give up hope because you’ll never know when you’ll be called. I guess the doctors didn’t believe in miracles. I didn’t seem to worry, however. My mom actually said that I actually told her that baby Jesus came to me and said I would be okay. I don’t know where a little three-year-old would get such an idea, but that is what my mom told me years later. It’s funny how I don’t really remember much about the hospital even though I was there for such a long time. I went back to the children’s ward when I was in my fifties; I just had to see it. I was amazed at how the smells and sounds of the place were so familiar to me. I remembered the waiting rooms, the child life center, and the hallways. It was like I was stepping into a dream. I actually volunteered there at the child life center to work in the oncology ward for a while, bringing art supplies right to the bedside of kids that were too sick to get up and go to the child life center. I loved that job. I guess that is why I became an art therapist because I loved going to the art room they had there for the children. This was way back in the 50s, before it was even called the “child life center.” It sure was a life line for me. I couldn’t wait to go there. We made just silly things like paper chains and glued collage pictures, but it made my day. Just to get out of the bed and play in there was what I seemed live for. I did this painting years later, when I was in my 20’s. I had this nagging memory that just was there in the back of my mind. I seemed to recall this angelic presence in my room that seemed to be watching over me. It’s difficult to explain, but I felt compelled to paint it. Maybe it was my guardian angel- I don’t know. Or maybe I was so delirious with fever that I imagined it, but somehow, after that experience, I got better. The doctors didn’t know how it happened either; I just got better. The combinations of drugs they gave me or the high fevers seemed to kill off the bacteria that was pillaging my body. Was it a coincidence? I don’t know, and I guess I will never be able to figure it but one thing is for sure: I went home from the hospital was able to start kindergarten at the appropriate age, and never had any recurring kidney problems. It was truly a miracle. I believe that this experience was the foundation for me to travel the road I’ve been on in this life time. My new book entitled, A Soul’s Journey discusses how I have always known that I was a spirit being. 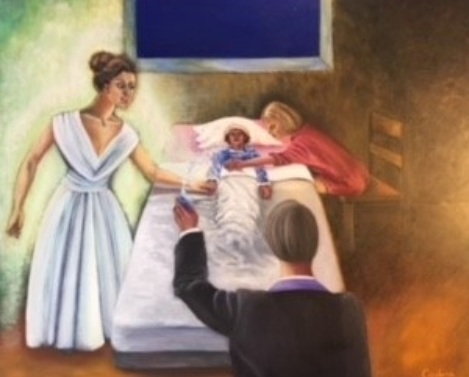 I spent so much time in the spirit realm as a child; I guess that is why the hospital didn’t seem to be a problem for me because most of the time, I was mentally and spiritually in the higher realms. I know that we are made of spirit and take on a new body every time in incarnate. I have been on a journey to learn all I can; I’ve read all the books on reincarnation, have studied different religious texts and am certain that the physical world in only a fraction of what we can experience. The spiritual realm is so vast, you travel there when you dream, and we can tap into the higher realms when we use lucid dreaming and guided imagery. You also have bleed through experiences from other life times, because your soul records every experience, every thought and action. I offer this information as a gift to those who choose to read it so they know there is more to life. There is the seen world and the unseen world. Now I have the tools to take you there-to the world of your all-knowing soul to experience your past lives, to find the forgotten memories of your past that will teach you about yourself, where you have been and why, so you can learn the lessons you need to, so you can clear up unfinished business and move on, to a fuller, more expansive, light- filled life. Visit www.pastliferegressionny.com I’ll be here ready to take you on your own journey when you ready.